The Wetland and Riparian Area Monitoring Plan (WRAMP) is a framework and toolset developed by statewide technical teams based on the three categories of wetland monitoring data defined by the USEPA. Level 1: Map-based inventories that answer questions about wetland abundances, distribution, and diversity. The primary Level 1 tool is the California Aquatic Resource Inventory (CARI). CARI is a digital standardized map of California surface waters (wetlands, streams, and riparian areas) using maps from the USGS’s National Hydrography Dataset (NHD) and USFWS’s National Wetland Inventory (NWI). California EcoAtlas uses CARI, project profiles, data from monitoring efforts, and other information to allow its users to explore the extent and condition of California wetlands. Project Tracker is an EcoAtlas data entry tool for uploading maps and tracking wetland habitat restoration, mitigation, and conservation projects. The Landscape Profile Tool is another EcoAtlas tool that summarizes data for pre-set areas using information from CARI, Project Tracker, the California Natural Diversity Database, National Land Cover Database, US Census, the CRAM database, and the California Environmental Data Exchange Network (CEDEN). The California Environmental Data Exchange Network (CEDEN) gathers aquatic data like water quality, aquatic habitat, and species health from different agencies for managers and others to find and share information. The Riparian Zone Estimation Tool (RipZET) works with GIS to help visualize and characterize riparian areas based on their “functional riparian width”. Level 2: Rapid, field-based assessments of overall wetland condition and stress, relative to the best achievable conditions. The primary Level 2 tool is the California Rapid Assessment Method (CRAM). CRAM is used to rapidly assess the ambient conditions of wetlands and streams as well as the performance of mitigation or restoration projects. CRAM is a cost-effective and scientifically defensible method for trained practitioners to assess the overall health of their particular stream or wetland. 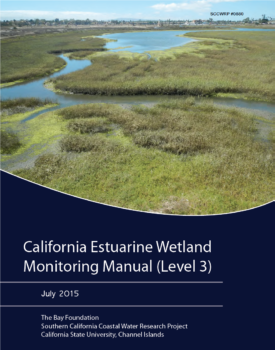 Level 3: Quantitative field-based measures of specific aspects of wetland condition or stress. The WRP has sponsored the development of Level 3 protocols for monitoring tidal marsh (Johnston et al. 2015) . In addition, there are protocols for Santa Monica Bay (Johnston et al. 2015), the San Francisco Bay Wetlands Regional Monitoring Program (CWMW 2010), the Interagency Ecological Program (IEP) (Sacramento-San Joaquin Delta; IEP 2012), and three National Estuarine Research Reserves in California (Tijuana Estuary, Elkhorn Slough, San Francisco Bay; Kennish 2004). The State Water Resources Control Board has developed the Surface Water Ambient Monitoring Program (SWAMP) to provide tools for standardized monitoring and assessment of aquatic habitats, data quality assurance, and data management. The document, Standard Operating Procedures (SOP) for Collection of Macroinvertebrates, Benthic Algae, and Associated Physical Habitat Data in California Depressional Wetlands, is a detailed manual for standard data collection of macroinvertberates, algae, water and sediment chemistry, and physical habitat of the site. The California Stream Condition Index (CSCI) is a biological index for scoring the condition of benthic macro-invertebrate communities in wadeable streams and rivers. Agencies and members of the public can use the CSCI tool in GIS and R to score the biological condition of their site. A comprehensive monitoring program should utilize the WRAMP Framework and existing Level 1-2-3 tools as much as possible.